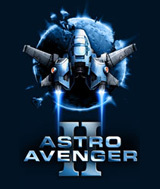 Astro Avenger II is a stunning comeback of the classic scroller that lifts up the level of action and drive in modern arcades. The spectacular graphics abundant with modern visual effects and atmospheric soundtrack will not leave you indifferent. It's the 24th century and an alien invasion is threatening the very existence of mankind. Jump in your ship and fire at will as you fight off relentless enemies through 50 progressive levels. Choose ship and weapon upgrades as you advance, but choose carefully, as your decisions will affect your future. Comments: This game is almost like playing astoids except you can upgrade your weapns and fire power. It was a pretty good game.